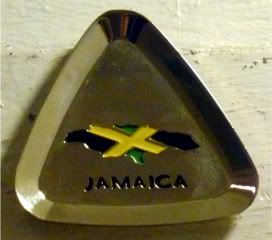 joy magnetism: "The fairest isle..."
What a supercool magnet my friend brought me back from Jamaica! I haven't been, and since it's an island, ya'll know it has little to no chance of me ever visiting. I know, I can't help it. Ya'll know how I feel about islands. I just went flipping through all the attractions and stuff and given that there's more than 500 years of European rule, an eclectic mixture of African, European and Asian cultures, and has more churches per square mile, I would bet that I'd never run out of things to see and do. Here's something: Did ya'll know that most of the world's pimento comes from Jamaica? Bet you didn't know that when you woke up this morning. And, oh my freakin' hell, Jamaica's home to the largest butterfly in the Western Hemisphere, the Giant Swallowtail, with a wingspan of 6 inches. Six inches, people! That's half a damn ruler! Yeah, that totally seals the deal for me, because ya'll know I can't stand butterflies, either. Let alone one with GIANT in its name!